Today's post is all about Instant Kesar Milk Peda. The traditional method of preparing milk peda is quite time consuming as it requires cooking milk in low flame until it thickens. But this instant peda can be prepared within 10 mins with condensed milk, milk pwd and flavored with saffrons and cardamom. 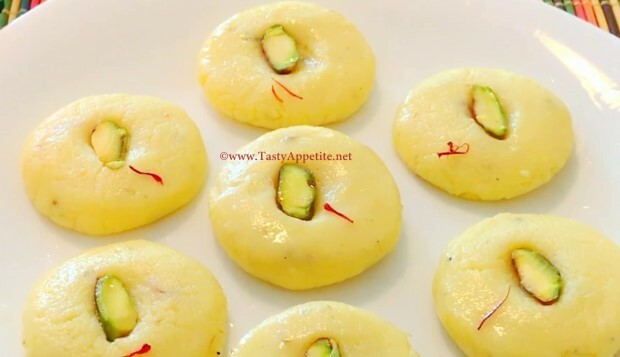 Check out this easy video recipe to prepare this super popular Indian Diwali dessert. Soak few strands of saffron in 3 tbsp of warm milk. Add sweetened condensed and stir. Add saffron soaked milk and combine. Add 2 tsp of ghee and combine. Turn off flame once the mixture got thick. Transfer the mixture to plate and allow to cool. Take a small portion and roll it to ball. Pat it flat and make a small dent in the centre as shown in video. Garnish with sliced pistachios and set it aside. Repeat the same for the rest of the mixture and arrainge the pedas in plate. Lipsmacking delicious kesar pedas are ready.